The SENTEX Crown Jewel is no longer available. Please call about our TAC 2-C Internal Retrofit Kit. The Crown Jewel Series is the most advanced compact telephone entry system available for gated residential entrances and door access points. Its elegant design and extensive features allow any resident or office manager to increase the level of protection while enhancing the value of the property. For an extra level of security, you may choose to view the person requesting access by adding a CCTV camera to the Crown Jewel. Direct live feed can be viewed by utilizing a television screen or monitor. Crown Jewel Model SNCJ3S . The system's main telephone line allows the Crown Jewel to dial a pre-programmed telephone number when the occupant is not at the monitored location. The person can then grant or deny access from that remote location. This can be programmed manually on an as-needed basis or time-activated to occur automatically when scheduled. Allows a person utilizing the system's main telephone line to answer a call from the gate or door while in the middle of another outside call. Similarly, if a visitor call is in progress and an outside call rings, they can switch over to the incoming call and return back to the visitor. Provides a unique double ring on the system's main telephone line to distinguish between a standard call and an access request call. Up to 75 unique 4-digit codes can be assigned to unlock the gate or door without needing to call the occupant and can be time-restricted. In addition, codes can be used to latch the gate or door open. The most recent 225 transactions are stored in the unit. These can be retrieved by the resident office or guard personnel to keep a complete record of on-site activities. The main or auxiliary access points can be configured to automatically open twice per day for a pre-defined time schedule. Perhaps you leave for the office at 7:30 a.m. and return at 5:30 p.m.; the gate can be scheduled to automatically be opened when you leave and again when you arrive back home. Up to 10 separate holidays can be defined to override the standard lock/unlock schedules programmed into the system. Allows the visitor to contact up to 3 different telephone numbers in addition to the unit's primary line. For example, this allows the system in a residential environment to call the main house, home office and a guesthouse. The Crown Jewel can be networked with up to 3 other Crown Jewels on a single telephone line when multiple entrances are required. Only the "calling" system location opens when access is granted. The Crown Jewel system will enable the primary telephone line to ignore all calls for a period of time. This can be accomplished manually by programming your request through a touch-tone phone or via a pre-programmed time schedule, such as 9:00 p.m. to 9:00 a.m. If one of the gates or doors is forced open or held open too long, the Crown Jewel can automatically be triggered to dial a pre-defined telephone number for notifying personnel of the alarm condition. An alarm can also be initiated if a visitor attempts too many incorrect entry code attempts. 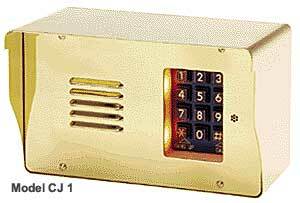 A Crown Jewel III style enclosure has been designed to support a separate call button from the keypad. A black & white or color CCTV camera can be integrated into the Crown Jewel and provide live video directly to a television or monitor screen. Each system can be site-configured to operate on the two types of available phone lines. Provides the ability to program and control the Crown Jewel via a personal computer from any remote location using a standard phone line and PC modem. The Crown Jewel is provided with a 365-day clock that accurately records the date/time scheduling and event transactions. Leap year is also automatically adjusted. The Crown Jewel Series comes in a variety of styles to match your environment aesthetically and functionally. Choose between the smaller profile enclosure or a larger profile unit that can support the camera option. Also you can select between polished brass, polished stainless steel or grained stainless steel. In the event power is removed from the unit, the database information will be retained in memory allowing immediate start-up and operation when power is restored. Crown Jewel units have some protection on the power and telephone line connections. However, in an area where lightning is prevalent, external surge suppressors should also be used to minimize damage to the unit. For extra gate or door access points you may opt to add a remote keypad to those locations instead of an additional Crown Jewel unit. 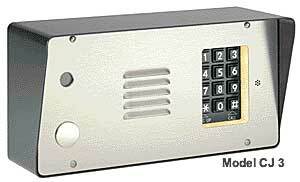 This optional remote keypad comes in either surface or flush mount for ease of installation. Crown Jewel camera enclosure units support an optional Medco Hysecurity Lock. Polished Brass Faceplate with Matching Enclosure. Polished Stainless Steel Faceplate with Matching Enclosure . Polished Brass Faceplate with Black Enclosure. Polished Stainless Steel Faceplate with Black Enclosure . Grained Stainless Steel Faceplate with Black Enclosure . Surface Mount - 11 lbs. Flush Mount - 8 lbs.